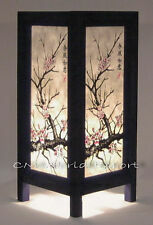 Asian Oriental Table/Desk Lamp Decor Lighting. 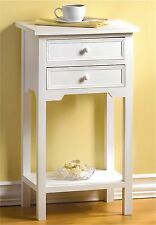 High Gloss Modern Nightstand Bedside Table "Flow"
The bedsides mimic the typical design of a Georgian tallboy / chest on chest but on a smaller scale. 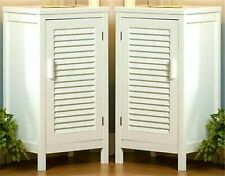 The top section displays reeded, chamfered corners and houses 5 of the 8 drawers, in a two-over-three design. 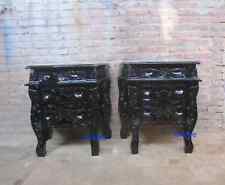 Antique Pair of English Victorian Burr Walnut Bedside Chests / Tables / Nightstands (Circa 1880). This is a fine quality pair of antique Victorian mahogany bedside chests, circa 1880, in good condition. The drawers are mahogany lined, constructed with dovetail joints. The bedsides each incorporate two hand dovetailed, mahogany lined drawers. Beneath the drawers is a simple shaped frieze, above a generous shelf space, the bottom of which has further satinwood string inlay to the exterior. 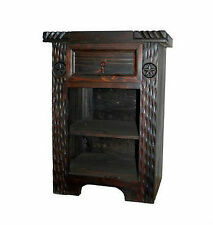 Here is a fine quality antique English Art Deco burr walnut bedside cabinet, circa 1930, in excellent original condition. The bedside is raised by inverted trestle shaped legs. 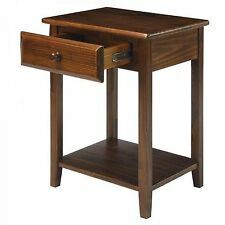 This bedside cabinet boasts classic Art Deco styling throughout; this is visible in the veneers, rounded corners and clean lines. This is a lovely pair of antique English Edwardian burr walnut bedside chests, circa 1910, in good condition. 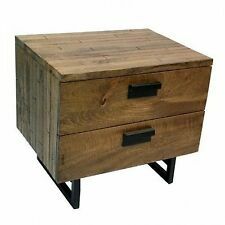 The bedsides each have four graduated working drawers, constructed with hand-dovetailed joints, pine drawer linings and the original knobs. Un peu abîmé sur le dessus (photo 2). Profondeur 29 cm. Antique English Pair of Queen Anne Style Burr Walnut Bow Front Bedside Cabinet Nightstands (Circa 1920). Here is a stunning quality pair of antique English Queen Anne style burr walnut bow front bedside cabinets, circa 1920, in excellent original condition. 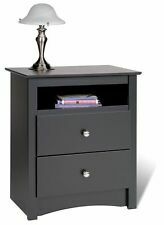 Nightstands provide a practical place to put essential items next to your bed at night, like lamps, reading glasses, books, remote controls, water bottles, supplements, and more. They serve as decorative pieces to polish off room décor, and they are available in a variety of colours, styles, and finishes. 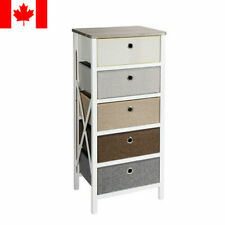 A blend of storage and style, nightstands are furniture accents with functionality. 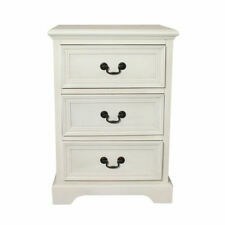 How do you choose a bedroom nightstand? There are no hard and fast rules for choosing a table. Keeping it generally the same height as your mattress will help it to balance the space. Use your headboard as a guide; if you have a substantial, chunky headboard, you might opt for a bedroom nightstand with the same lines and style. If the top of your bed is oversized, you can get away with taller tables no more than halfway to the top. Conversely, if your bed frame is low, you may want to keep your stands as low as the base. Width, depth, and finish are completely up to personal preference, and usually have more to do with the amount of things you put on your table than anything else. 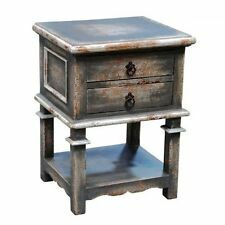 Err on the side of too big rather than too small so that your bed doesnt end up dwarfing your bedroom nightstand or bedside table and so that you don't run out of room. How do you ensure that a nightstand will fit? Measuring a bedside table means keeping all three dimensions in mind. Preferably with a tape measure, line the bottom of the tape measure that starts with zero up with the bottom of the wall next to your bedside. Estimate how tall you would like your stand to be, and note the corresponding number on the tape measure. Do the same with width, ensuring that there is enough space between bed and wall for your Bedside table. Lastly, measure out from the wall parallel to the floor to see how deep your stand would be. Ensure that you have enough room to comfortably climb into bed considering table depth. Measuring can also be accomplished with a yardstick if a tape measure is not an option. 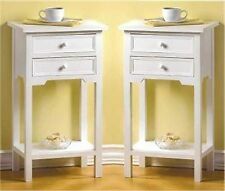 What are some nightstand furniture storage solutions? Putting a skirt or tablecloth on a bedside espresso nightstand can hide drawers or shelf storage if you would rather keep it out of sight or pair the stand finish with fabric. Storing a power strip in a nightstand drawer and running the power cord out the back can be an organized way to charge tech devices in your stand and increase storage.